I'm looking for a luxury sedan for about $20,000. What should I buy? If you're looking for luxury on Canadian roads, you don't have to be stuck with two-wheel drive. There are plenty of options on both sides of $20,000, including the 2012 Cadillac CTS AWD ($17,612), 2012 Acura TL AWD ($18,820), 2012 Audi A4 Quattro ($19,613), 2010 Lexus GS350 AWD ($21,232) and 2013 BMW 320i xDrive ($22,214). Let's take a look at two that stand out: the Mercedes-Benz C300 4 Matic from 2013, a good year for C300 reliability, and the 2012 Infiniti G25x. Fuel economy (litres/100 km): 11.9 city, 8.7 highway; premium gas C stands for compact and comfortable – but not cheaply made. 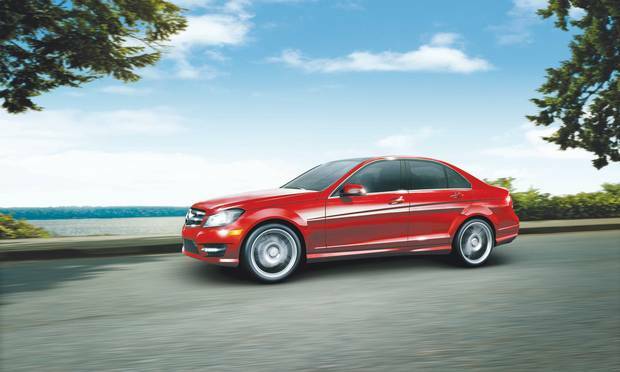 "Though it's the company's entry-level model, the 2013 C-Class is very much a Mercedes-Benz," review site Edmunds said. "That means it offers that feeling of quality and solidity throughout that define the marque, not to mention a ride and handling balance that should strike most folks as just right." For 2013, the C-Class sedan came in five trims: the C250, the C300 4 Matic, the C350, the C350 4Matic and the souped-up, 451 hp C63 AMG. The C300 and C350 share the V6, which was bigger (3.5-litres instead of the previous year's 3.0) for 2013. The C300 gets 248 hp; the C350 ($25,995) gets 302 hp. Edmunds said the C-class was meticulously engineered and constructed, with refined ride and handling, excellent brakes and decent fuel economy. Drawbacks? The C is smaller and pricier than some rivals – and the 4 Matic isn't offered with the C250's four-cylinder, Edmunds said. "The C300 is agile, quiet, and comfortable. The ride is steady and taut," Globe Drive said. Consumer Reports liked the C-Class and, for 2013, gave it 5 out of 5 for reliability, up from 2 out of 5 in 2012. "The cabin is impeccably furnished, with great front seats. Some controls are a little hard to get the hang of, but they're simpler than the Benz's closest rivals," the magazine said. "Our biggest beef was the rear seat, which is tight for two adults, let alone three." There was a recall for daytime running lights that hadn't been activated on 36 C63 AMGs. 2012 Infiniti G Line Sedan. Sure, its engine was smaller than the G37's 328-hp, 3.7-litre V6, but, gee-whiz, was the 218-hp Infiniti G25 ever a good deal. "If you're now thinking 'but gee, will I be disappointed' the answer is, not necessarily," Globe Drive said. "[The G25] manages passing or merging with more than enough verve and handles around-town motoring with snappy downshifts that let you manoeuvre through traffic deftly, while delivering a worthwhile fuel economy bonus over the G37." The G25 only lasted for two model years. 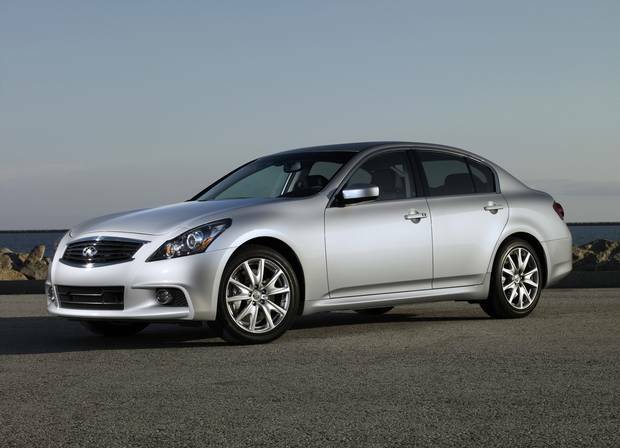 The 2012 G25x (the x signifies all-wheel drive instead of rear-wheel drive) is about $5,000 cheaper used than the G37x. With either engine, the G "offers an engaging driving experience matched by a scant few competitors," Edmunds said. "[It's] a great sedan for driving enthusiasts and value-minded drivers alike, providing a sensible blend of performance, space, luxury, convenience and high-tech features that's difficult to match." Consumer Reports liked the handling, smooth transmission, front-seat comfort, and high-quality fit and finish. It complained about the snug interior and small trunk. It said the "cabin was mostly quiet with well-suppressed wind noise and only minor road noise over rough surfaces – the 2.5-litre V6 has a smooth, sporty note, though it tends to sound a bit rough at higher revs." And the ride? "Quite taut and nicely controlled, but not the cushiest. Bumps are absorbed reasonably well," it said. Consumer Reports gave the 2012 G three out of five for reliability – down from five out of five in 2011. That year, G37 owners complained of premature brake wear. There were no recalls. Send your used-car questions to globedrive@globeandmail.com.